Facebook widgets, including the "Like" buttons, are often used to spread spam and propagate scams. Typically, the scammer creates a page with a fake video player. Users are tricked into clicking on Facebook Like buttons hidden behind a fake Play button. This is called Likejacking, and it's a specific form of clickjacking. I have posted a Youtube video showing in June that explains how these Facebook widgets are disguised. On Firefox and Chrome, an icon is displayed in the URL bar when a page contains at least one Facebook widget. If the page is suspicious, meaning hidden widgets were detected, the icon has a red background. 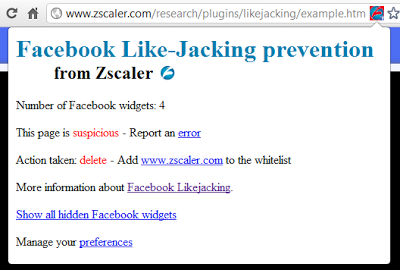 You can use https://www.zscaler.com/research/plugins/likejacking/example.htm as an example of a suspicious page. The popup (Chrome), or toolbar (Safari and Firefox) also let users take some action on the page: they can whitelist the current domain (see more below), manage their preferences, or display the hidden Facebook widgets on the page. You can also report back to Zscaler, any page that was classified improperly by clicking on "Report an error". This will open a new tab in your browser and send you to a form on the zscaler.com website. We will use this information to improve the add-on. As you can see in the Youtube video, it is possible to expose the hidden widgets. The extension can modify the source of the page (opacity, height, weight, z-index, overflow, etc.). You can try this feature on https://www.zscaler.com/research/plugins/likejacking/example.htm. Delete all Facebook widgets - Choose this option if you never use "Like" buttons on external sites. You can always whitelist a domain to keep the widgets on a particular site. Always ask for explicit confirmation - A popup will warn you that you clicked on an element that is trying to post to your public profile. You can decide to stop the action, or to let the page post to your profile. This is a good option if your rarely click on "Like" buttons. You can also whitelist domains so that no protections are applied on a given site. The popup, or toolbar, can show you what action was taken on a page -- for example confirm, remove, or ignore (no protection applied). The extension does not affect the ability to use the main Facebook site; it protects users only on other sites that use widgets from Facebook. Some Facebook widgets are hidden by design. This is normal, and the the extension will not list them as suspicious and will not apply any protection on those. I will post another blog on the process of creating the plugin for different browsers to explain the challenges I faced on each platform.